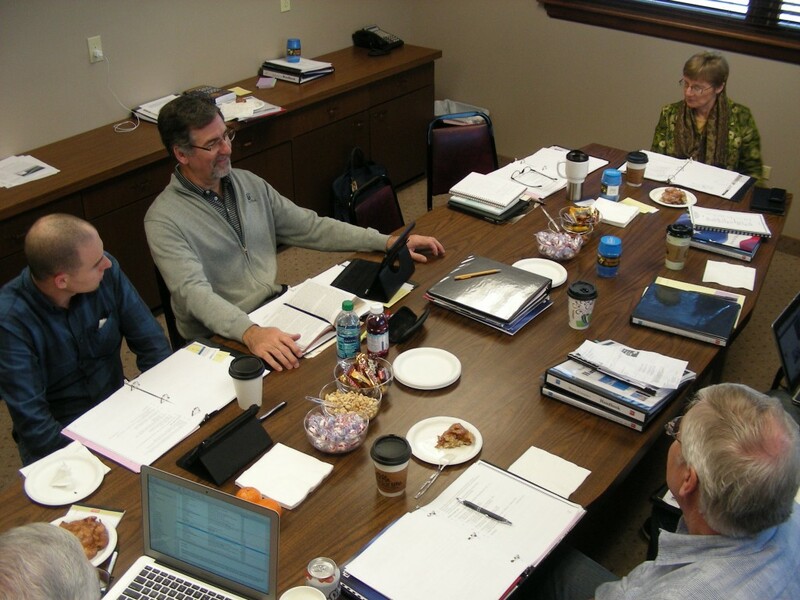 The board of GraceConnect (The Brethren Missionary Herald Company) meets in Winona Lake, Ind. The board of directors of GraceConnect (Brethren Missionary Herald Company) met this week for the first time since a new brand was introduced for the 74- year-old media organization. Led by Barb Wooler, board president, the group evaluated action taken since the board approved a new direction last October for the company. The GraceConnect news website was unveiled in January and a redesigned magazine, GraceConnect, was mailed in mid-March. Executive director, Liz Cutler Gates, shared the progress in introducing GraceConnect, a new brand for BMH that also includes the development of an e-newsletter (yet to be launched), a redesigned website for bmhbooks.com (coming soon), and the release of a number of BMH Books products in e-book format. The focus of GraceConnect as a media ministry is on communications (family news for the Fellowship of Grace Brethren Churches), conversation (encouraging thoughtful dialogue about matters of Christian living and theology), and conservation (preserving the history of the Grace Brethren movement). The board lauded efforts by the GraceConnect/BMH staff to maintain a balanced budget and traditional communications (like GraceConnect magazine) while exploring new opportunities in social media and digital publications. Board members, in addition to Ms. Wooler (Winona Lake, Ind. ), include Bob Arenobine (Fort Wayne, Ind. ), Bruce Barlow (Winona Lake, Ind. ), Daron Butler (Wooster, Ohio), Dave Collins (Ripon, Calif.), Rick Fairman (Lititz, Pa.), Bill Gordon (Warsaw, Ind. ), John Rowe (Ashland, Ohio), and Tim Sprankle (Warsaw, Ind.). Follow GraceConnect on Facebook and Twitter (@graceconnectus) for regular news from Grace Brethren churches and ministries.